​​The Humber Star for chamber ensemble and video, 14'. ""Humber Star", for example, had a fantastic depth and poignancy. A poem by Yorkshire writer Adelle Stripe, it was set to a strings and alto flute score by Reykjavík composer Halldór Smárason, and performed at Queens Hall by local poet Vicky Foster with the Sinfonia UK Collective. 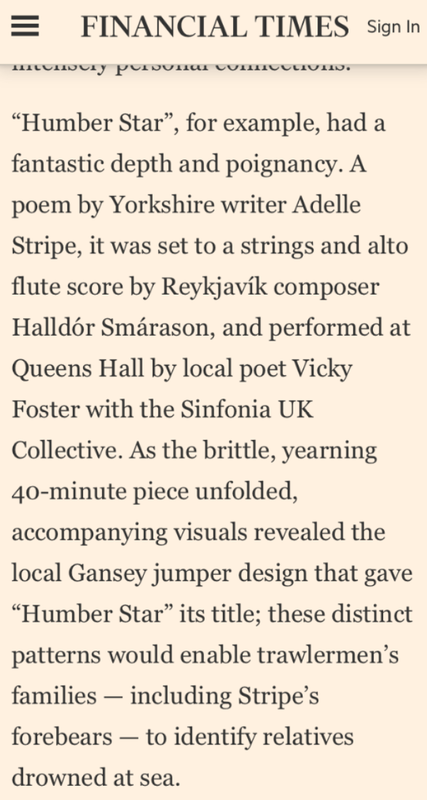 As the brittle, yearning 40-minute piece unfolded, accompanying visuals revealed the local Gansey jumper design that gave "Humber Star" its title; these distinct patterns would enable trawlermen's families - including Stripe's forebears - to identify relatives drowned at sea." "Local poet Adelle Stripe’s highly personal Humber Star, set to a sublime chamber orchestra score by Iceland’s Halldor Smarason, drew on a quietly devastating family history of maritime tragedy." "[...] piece by poet Adelle Stripe and composer Halldór Smárason, performed by the UK Sinfonia with our very own Vicky Foster bringing Adelle’s words to life. Queens Hall was packed yesterday evening, as we led in the words of Russ Litten echoed down the generations. Bridging the gap between the earlier work, and the piece we were about to witness called Humber Star. Both works spanning the day, in a narrative arc that spoke of the bravery and tragedy of the men that lost their lives at sea and the women and families they left behind. I’m a city lad, I often say that I have concrete running through my veins, but yesterday I realised that isn’t necessarily true. I felt the salty brine rush through me, the music and words lashed at my face, and I felt the cold chill of my seafaring heritage in my very marrow." The Humber Star for chamber ensemble and video, 14'. "Tadcaster poet Adelle Stripe’s Humber Star drew on her family history to tell a story of the devastating impact of death at sea, and the accompanying score by Halldór Smárason and Sinfonia UK really captured the cruel power of the waves." it means what you think it means for piano trio and video, 7'. ​"A truly personal approach was heard in Halldór Smárason's it means what you think it means: Small, fragmentary series accompanying a television show from the 70's starring Anthony Burgess; mostly quiet, but sometimes with sound. This strange juxtaposition was so abstract that it seemed random, but in some way it managed to work perfectly with both an intriguing synthesis and comic effects." 1972 - II. Game 13 for amplified chamber ensemble, electronics, chess set and video, 7'. kind of virtuosity we’ve come to expect of Chatterbird.​"
Pólypsar for violin and electronics, 2013/2015, 10'. "[Halldór Smárason's Pólypsar] was for amplified cello and indulged in wonderful percussive effects and vertical bowing which would generate echoes in the electronics’ delay formula." Vegfarendur og ég for soprano, flute, clarinet, violin, cello, piano and video, 2011/2016, 12’. "All the pieces were fun and listenable. The work Vegfarendur og ég (e. Pedestrians and I) included a video footage showing an intersection in Reykjavík. The piece is based on an older piece by Halldór that was premiered at Dark Music Days in 2012. The audience watch cars and other pedestrians either stop on red lights or continue their journey, while the sun slowly sets. This was incredibly sedative and calming.In the beginning, Elísabet read a hypnotic text that gradually changed into reflections and speculations on the hypnosis. The music was also soothing, slow and balanced, but also tensive to a certain degree, creating a little strain between the music and the video. The singer's breath and voice led the audience into the atmosphere of the video and gradually got integrated more and more into the music, as she stopped reading the text and started to participate in the instruments' texture. This was very sedative, almost lulling despite the underlying tension. It was nice to start of the festival by shaking off the everyday stress." "[...] In Halldór Smárason’s piece Vegfarendur og ég, soprano Einarsdóttir conducted col legno cello figurations and prepared piano percussives as she vacillated between bel canto and sprechstimme singing, breathing and blowing into her microphone as a CCTV video feed of a roadway intersection played. Woodwinds predominated as Margrét Árnadóttir’s walking pizzicato bassline on the cello meshed with vocal utterances of vowels and consonants, creating disparate continuities." Sætabrauðsdrengirnir, arrangements and piano performance. "[...] there was a young man sitting at the piano playing jazz. This was Halldór Smárason which many may not know. I remembered him from a concert last summer where he had two inventive and outsanding works performed, that showed his undeniable talent. Additionally, they were funny. On the other hand, Halldór was great on the piano. He is a magnificent jazz musician and made all kinds of skips, runs and fast chord changes look easy. And all the jokes worked perfectly, people literally rolled with laughter." "Second, a new piece by Icelandic composer Halldór Smárason, ‘it means what you think it means’, inspired by his searches through the Burgess archives. Based on an American interview with Burgess, the piece again wonderfully combines spoken word with original sound – and it is an incredible range of sound that is achieved from the three instruments." Harðorðað for viola d'amore and electronics, 5'. "Three minutes into the concert and the Italian Marco Fusi had already spitted, knocked, swiped, torn and plucked his extraordinary string instrument. [...] The composer of the spits and knocks, Halldór Smárason (1989), living in New York, offered a wild etude." Skúlptúr 1 for guitar and electronics, 4'. "The Icelandic Halldór Smárason, who studies composition in New York, had arrived in Malmö to present his Skúlptúr 1. It is written for acoustic guitar and electronics. The electronics slide deftly between being an extension of the guitar sound, performed by Niklas Johansen, and looked to be a musical autonomous entity controlled by Halldór Smarason, like an invisible gamemaster-wizard. It seems "old school"-modernist-cool after Wainwright's low-tech cigar box; and it's great." "The last of the new pieces, _a_at_na by Haldor Smarason, proved something of a frustration. The piece for four violins, viola, cello, clarinet, prepared piano and tape was really rather mystifying. To a large extent it consisted of long, low, drawn-out phrases with no apparent direction. Coupled with this were a series of projected images that seemed to have no connection to the music, making for a decidedly puzzling experience." 1972 - I. Fyrir for solo percussion, electronics and chess, >2'. "I won't forget this concert for a while. If not only for the opening piece. That was called 1972, written by Halldór Smárason. The title refers to the World Chess Championship just over forty years ago. In the piece, two men stood at a table and played chess. Microphones had been placed at the chess table, that so it was clearly audible when the pieces were moved. The ticking chess clock was also clearly delivered; when they pressed the buttons it was heard as a loud noise coming from the speakers. Various events were interpreted with very short percussion playing and when a piece was captured a note was invariably played on a keyboard. The result was pleasantly exotic, the amplified clock tick was haunting. It was steady and calm; in perfect contrast with the tension in the chess, which grew increasingly more tangible. As a piece of music, it was cool." Pólypsar for violin and electronics, 10'. "Another composition by Halldór Smárason, Pólypsar, was also great. It was written for amplified violin, performed by Una Sveinbjarnardóttir. For the longest time, Una swiped the bow up and down the strings, and made the violin crackle. She also breathed heavily. The violin playing sounded like an asthma patient having a bad attack. Toward the end the dyspnea transformed into a gorgeous singing. Una's performance was world-class; she even delivered such a calm piece of music with focused enthusiasm which is so characteristic for her. This was an amazing experience." "...fine composition by Halldór Smárason called Grunnavík. It was written for oboe and string trio. The music was profound." "His music was cool; it was based on haunting ideas that developed pleasantly. They went through exciting transformations and faced unexpected fate, which were still rational. The drama behind the title was reflected in a convincing structure, alarming at times. Halldór is clearly a promising composer."